Ahhhh autumn. Season of cozy socks, bonfires, apple pie and sunflowers. Just as the days seem to get a little shorter and gloomier their cheerful faces can help but put a smile on mine. alas with the first frosts they too will fade but have no fear! 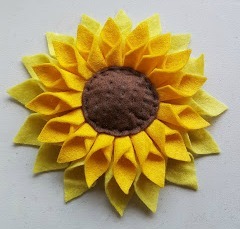 Here we will show you how to make your very own felt sunflower to bloom forever. 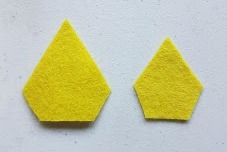 Yellow felt. 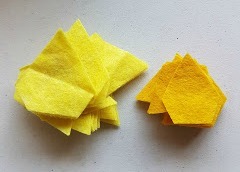 You can use two tones of yellow if you like to make the inner row of petals more interesting. Card. I just used an old cereal box. 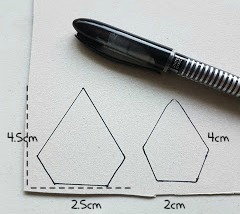 Use the card and pen to cut out 2 templates for the petals. The outer ring of petals will be slightly larger than the inner ring. 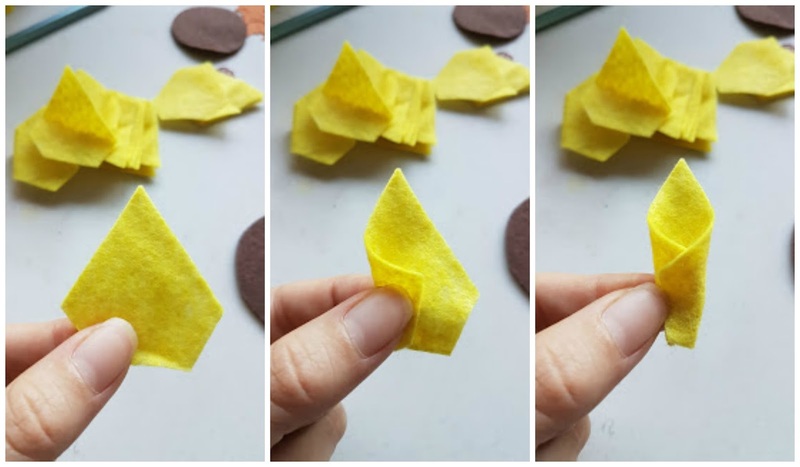 The exact shape of the petals isn't too important, just this rough shape is fine. 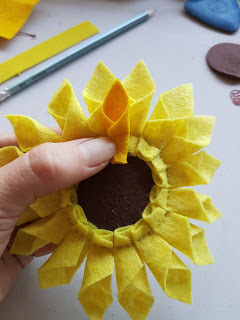 Cut out the base and centre of the flower in brown felt. 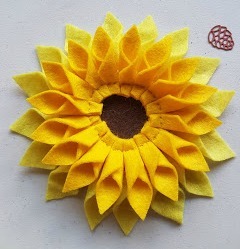 The base is 6cm and the inner 4.5cm, this will make a flower approximately 16cm in diameter. You will need 15 Larger outer petals and 15 inner petals. 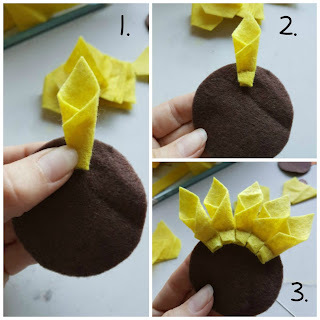 Hold one of the outer petals and fold the wings one side over the other. It doesn't matter which way round you do it as long as they are all the same. Sew the petal onto the base circle of felt (its the bigger one). 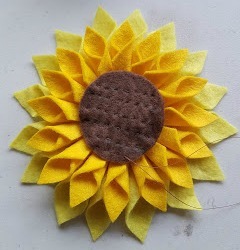 Sew all the petals onto the base until the circle is filled. Repeat this process with the inner petals. 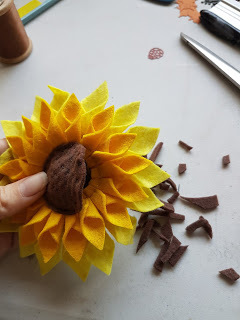 Place the inner petals so that the tip just reaches the shoulder of the outer petal. 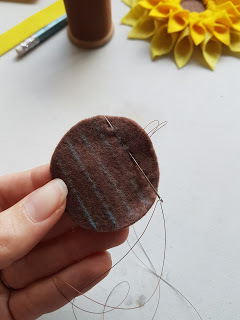 Sew a loose running stitch back and forth over the inner circle of felt. this will give it a textured finish. Place the inner circle over petals and sew around the edge to secure leaving a 2cm gap. 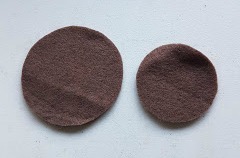 Fill the centre pocket with your offcuts of felt to make it stand out a bit, then sew the gap closed. And there you have your own ever blooming sunflower! 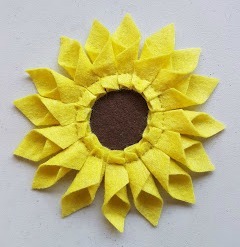 Try using different combinations of colour for the petals or sewing little beads over the centre to look like seeds. I hope you like this tutorial. Please check out our Facebook page at Today, We Craft! And don't forget to like us to get updated about new tutorials. 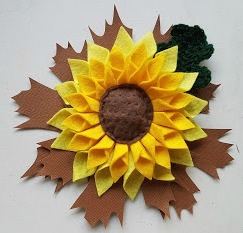 I love the sunflower! I adore all things fall and just stopped myself from buying sunflowers at the grocery store the other day. I’m also a felt crafter. Thanks for the tutorial!